A company that is trying to beat Elon Musk in the "Internet from space" race just got a half-billion dollar investment from a group of serious power players. 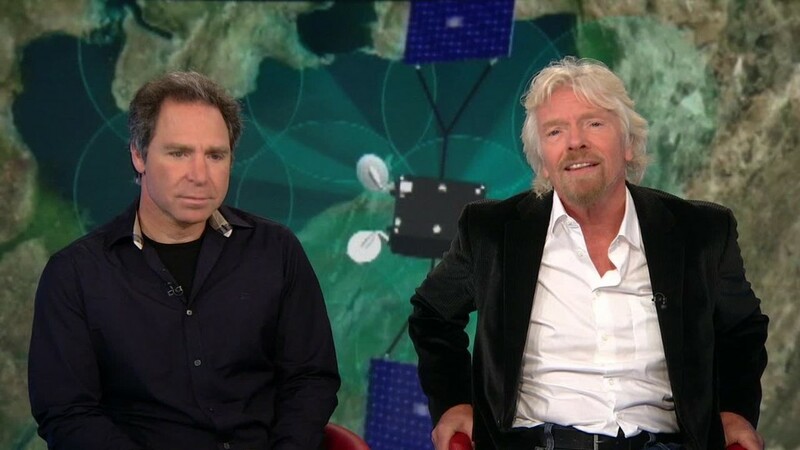 Coca-Cola (KO), Richard Branson's Virgin Group, Airbus, Qualcomm (QCOM), and a handful of other companies announced Thursday that they are backing Internet satellite company OneWeb with a $500 million round of funding. OneWeb, like Musk's SpaceX, wants to deploy hundreds of tiny satellites in low-orbit to bring high-speed Internet and phone service to people without connections around the world. Each of the investing companies will provide some kind of aid to get the project off the ground and help OneWeb achieve its goal of providing Internet from space by 2019. For example, Airbus is designing and building the 900 microsatellites that will be deployed in a constellation around the Earth. Virgin will help launch the satellites from its LauncherOne plane. Qualcomm will provide expertise on the cellular and Wi-Fi radios needed to extend the network's reach. So why is Coca-Cola backing OneWeb? The beverage company said OneWeb will help it connect to potential customers in places where it currently can't reach. "This project is exciting because it combines commerce with purpose," said Bea Perez, chief sustainability officer of Coca-Cola. "We believe it will help spur local economic development where people are in the greatest need, while also helping our business by improving real-time access to some of the world's most remote areas where we are already active in helping provide opportunities for entrepreneurs." Other OneWeb backers include Bharti Enterprises, EchoStar (SATS), IntelSat (I), and Grupo Salinas. Bharti, which provides telecommunications services to 20 countries across Asia and Africa said it will distribute OneWeb Internet to its customers. Grupo Salinas also said it will include OneWeb as an Internet provider for its Mexican customers. But OneWeb has some serious competition. Musk's SpaceX asked the FCC earlier this month to let it start testing a similar service. SpaceX said it wants to start testing out the technology in 2016. Musk's plan is somewhat more ambitious: Eventually, SpaceX plans to launch 4,000 satellites to serve potential customers. That's more than four times the number that OneWeb plans on deploying. Like OneWeb, SpaceX also has some powerful backers: Google (GOOGL) and Fidelity provided the company with $1 billion in funding for the Internet satellite project. You can already get an Internet signal from above. But it requires special hardware. It's spotty, slow and ludicrously expensive. OneWeb and SpaceX's equipment would be closer to the ground than typical satellites, orbiting at around 750 miles above the surface. That allows for tighter light beams and faster Internet than geosynchronous satellites. The downside is a much smaller coverage area, requiring hundreds -- or thousands -- of satellites to be launched.